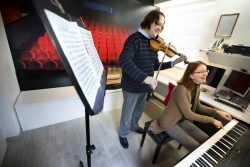 Wijntjens – Viool en Piano is a dutch company, founded in 2006 by the musicians Dennis Wijntjens (violin) and Vera Melnichenko (piano). We give concerts in The Netherlands and Belgium and private violin, viola and piano lessons in Maastricht and surroundings (+20km). Our private studio is situated in Maastricht. Lessons in your home are possible too, depending on where you live. We also offer live violin, piano and viola lessons via videoconferencing (webcam). We speak and understand english; lessons in english are possible. You can contact us in english language if you have any questions. You can see a machine translation of our website in english language. In general it is understandable, but there can be some strange words and sentences. You can now try to continue in english or in Nederlands.